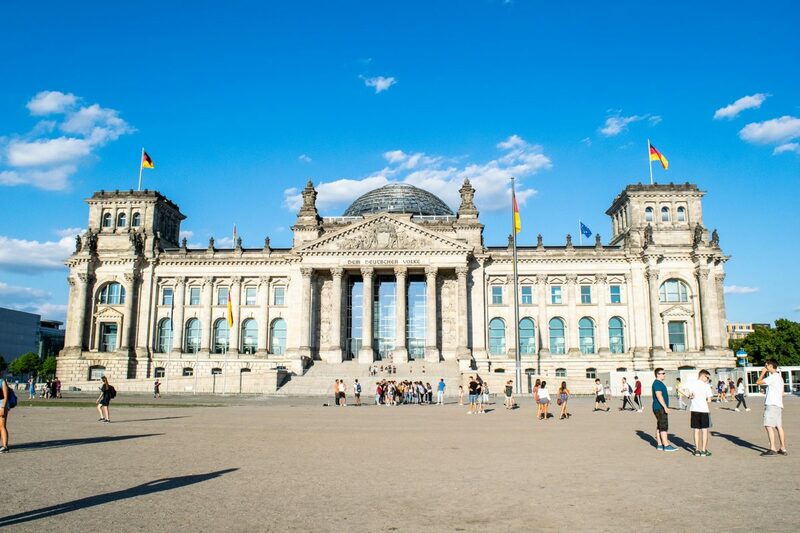 You could easily spend weeks on end in this amazing city, but if you only have 3 days in Berlin you want to make sure that you pack those three days as full as you can. This little 3-day Berlin itinerary will hopefully help you plan out where to base yourself so you don’t have to waste too much time traveling, the top spots that you don’t want to miss on your first trip to Berlin, and a few seriously great restaurants and bars to keep you busy in the evenings. If you’re wondering what to pack for your summer trip, check out my post about what to wear in Germany in July! 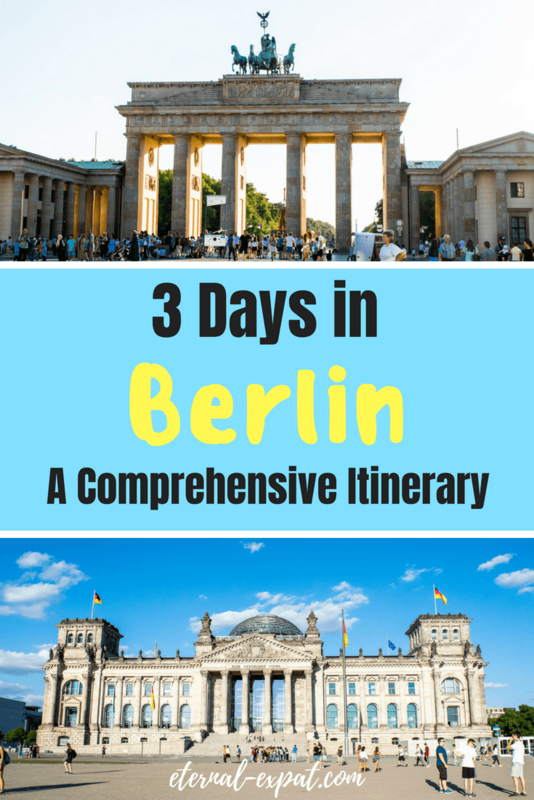 If you’re trying to figure out where to stay in Berlin and you’re only going to be spending 3 days in Berlin, you want to make sure you stay close to all the action. I really like the area around Alexanderplatz and into Prenzlauer Berg. Alexanderplatz has a rich history as the center of East Berlin and is one of the biggest transportation hubs in Berlin. That means you can easily and quickly get to the rest of the city by tram, bus, train (S-Bahn), or subway (U-Bahn). H2 Hotel Berlin is a great option. 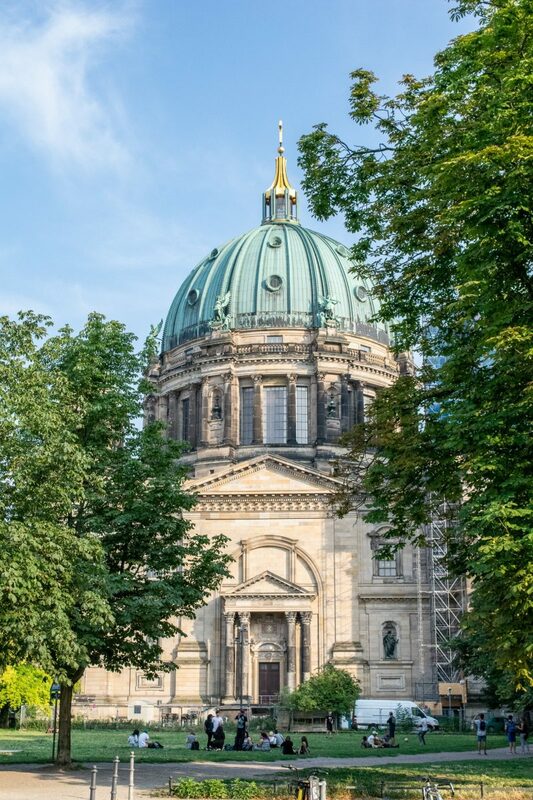 Rooms start at less than $80 a night during peak season and it’s a really short walk to places like the Berliner Dom and Museum Island. Book the H2 Hotel Berlin here. If you’re looking for a more budget option, the Generator Hostel is a great option. It’s only two metro stops away from Alexanderplatz and it’s in a nice central neighborhood (Prenzlauer Berg – my favorite area in the city!). They have mixed or female only dorm rooms, it’s super clean, has a nice common area, and a really well-equipped kitchen. Twin or double rooms are as low as $30. Book a bed at the Generator Hostel here. I stayed at a fantastic Airbnb in Prenzlauer Berg that I highly recommend. It was a shared apartment with the owner, but we had a huge bedroom and access to the entire eclectically decorated apartment. It was right in the downtown area of Prenzlauer Berg and only a two-minute walk from a metro (U-Bahn) station. You can see that Airbnb here. If you have never used Airbnb before, signup with this link to receive up to $30 off your first booking. Mitte, or the center of the city, is a great place to start your tour of Berlin. If your hotel doesn’t offer breakfast, stop into one of the many bakeries around Alexanderplatz for some pastries and a coffee. Grab a pretzel or small sandwich to have as a midmorning snack so you don’t have to stop touring to look for a restaurant (I dare you not to eat those warm pretzels immediately, they are SO DELICIOUS and I have zero self-control). From Alexanderplatz, you can walk along Karl-Liebknecht-Strasse for about 10 minutes in order to get to the Berliner Dom. This is the cathedral in Berlin and is a beautiful place to start your day. 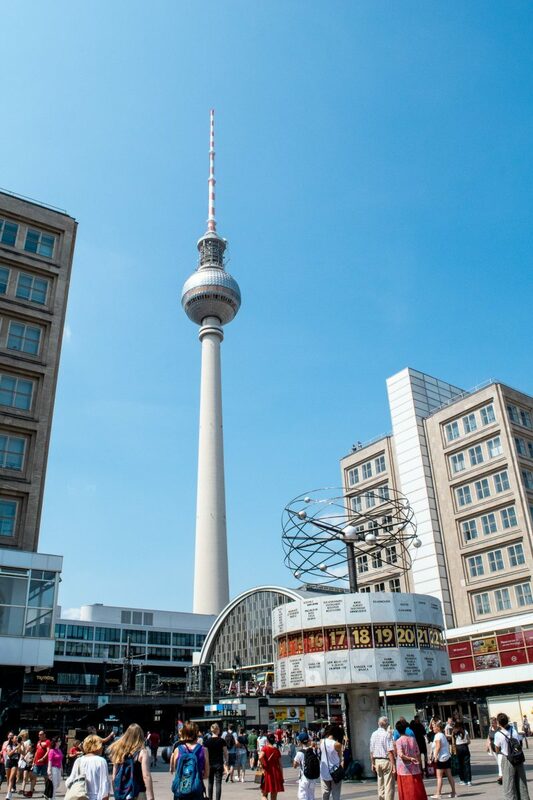 Did you know that this big tower was a gift from the Soviets and is meant to be a replica of Sputnik – it was meant to be seen from all over Berlin and be a bit of a middle finger to the west because at that time they were “losing” the Space Race! It usually costs about €7 to go inside the cathedral (it’s slightly cheaper if you have a Berlin Welcome Card) and includes a view of the inside of the church as well as access to the roof of the dome where you can look out over the city. Just be aware that the climb up to the dome is steep and there are a ton of stairs (over 200!). 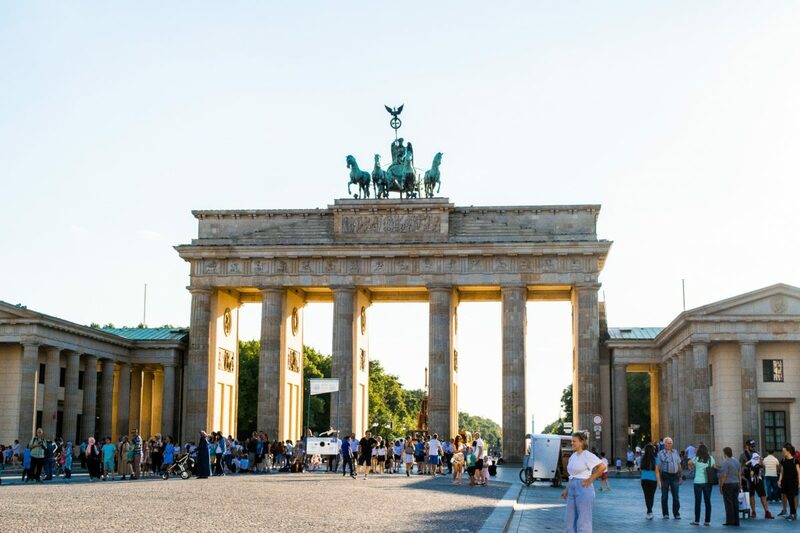 Once you are done at the dome, hop back onto Karl-Liebknecht-Strasse and carry on walking until you get to the famous Brandenburg Gate. You can take a few photos, but just know that it is constantly packed with tourists and touts trying to sell you all manner of things. If you’re feeling hungry, there is a great little currywurst stand in front of the gate. It might seem touristy, but having sampled a few currywurst around the city, I can assure you it is only about a Euro more expensive than the others and it tastes just as good. 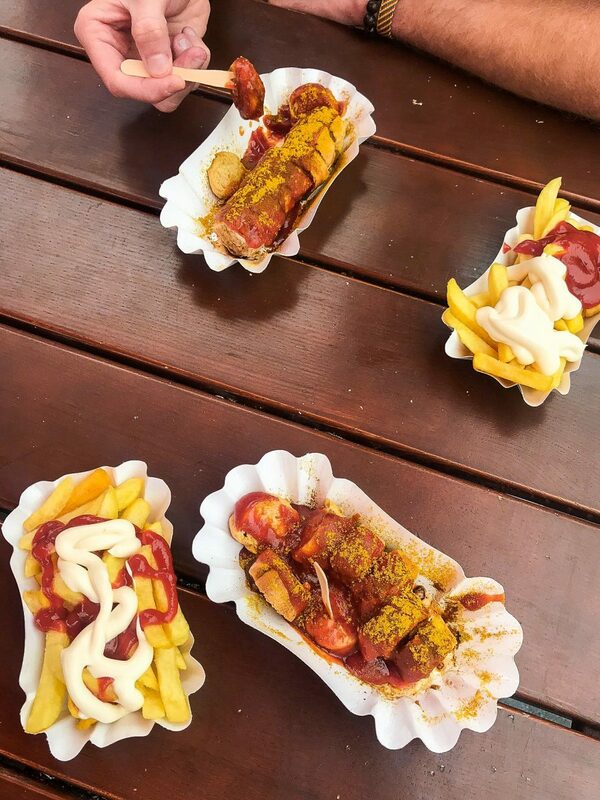 The infamous Currywurst – it tastes better than it looks! If you’re not familiar with a currywurst, it’s a popular Berlin street food. It’s a nice Berlin sausage topped with ketchup and curry powder. You eat it with a little toothpick or small fork. Choose to have it either with a bread roll or a few fries. After you pass under the Brandenburg gate, turn left and in a block, you’ll reach the Memorial to the Murdered Jews of Europe. It is an abstract space which has very little information about what you’re meant to feel. The artist who designed it created each block to be a slightly different height or width, just like human beings are all slightly different in height or width. Other than that, it is up to you to experience whatever you feel and reflect on the atrocities in your own way. The famous Brandenburg Gate in Berlin! From here you can cross the road and see the Memorial to the Homosexuals who were persecuted and murdered during World War II. While you’re at it, the area also has a fascinating memorial to those that were “euthanized” during the war because they were not well enough to work, making them useless to the Nazis. Be sure to read the information plaque about what it was like for people with disabilities, illnesses, and other mental health issues during the Nazi Regime. The final memorial that I recommend checking out on your tour of World War II memorials is the memorial to Romas and Sintis. They were another group of people that were condemned to concentration camps during the war. Romas and Sintis were required to wear black triangles on their clothing, so that has been used as part of the memorial. The poem that surrounds the fountain is truly powerful. I highly recommend finishing the afternoon with a tour of the Reichstag. It’s completely free, but you do need to book in advance. You can book a tour here. The Reichstag is the federal government building and the tour is a really fascinating look into the history of government in Germany and what the country is doing now to ensure that they never have another party gain as much power as the National Socialists (did you know that was what Nazi stood for? I didn’t!). The tour also includes a walk up into the glass dome which gives you incredible views over the city. During the hot summer months, going towards the end of the day means fewer people are there and it is much cooler that during the height of the sun. Head to Die Berliner Republik to finish your evening off right. It’s a great spot to sit along the Spree (the river through Berlin) and enjoy a few German beers. They also do local foods like pork knuckle and pickled ham hock (eisbein). There’s no denying that one of the biggest draws of Berlin is Berlin Wall. The history of this city is so recent, so raw, that it would be a real shame to leave without learning more about it. I highly, highly recommend starting your day with a Cold War Tour. I took a “free tour” with Generation tours. I put “free tour” in quotes because the tours aren’t exactly free. You pay what you feel it’s worth at the end and this tour is worth a lot. In the week that I was in Berlin, we took two tours with Generation Tours and both guides we had were absolutely outstanding, but I really think that the Cold War Tour is worth doing if you only have 3 days in Berlin. A memorial piece of street art. Those poles represent where the wall once stood. The tours meet at 11 am near the Berliner Dom and last about three and a half hours. It takes you along one of the largest areas of the Berlin Wall where you’ll learn all about how people attempted to escape from the East over the wall to the West and what that was really like (very difficult and usually ended in death). 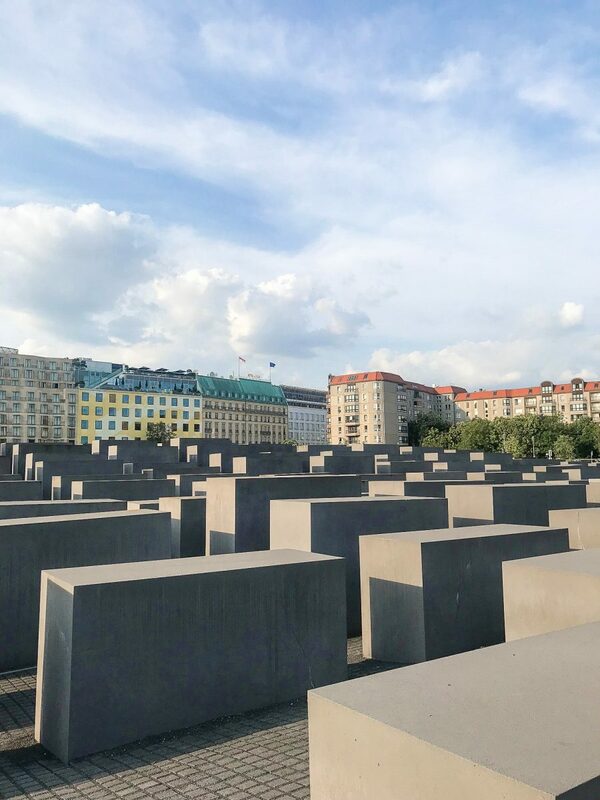 This tour was truly one of the highlights of my time in Berlin, which is why I think even if you only have 3 days in Berlin, you should make this part of your trip. Once the tour is over (it ends near the Northern S-Bahn Station), you should grab a sandwich along Invaliden-Strasse where there are several cafes and bakeries. 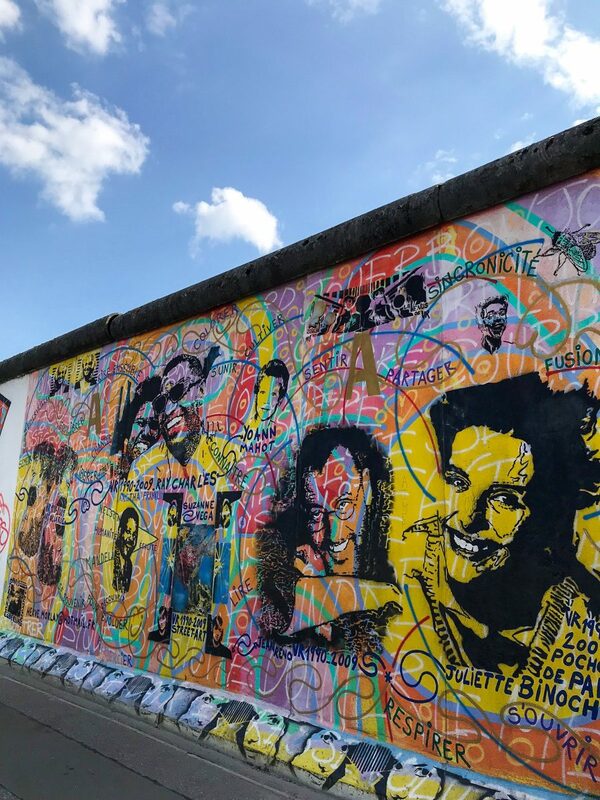 Then head to the Berliner Mauer Museum so that you can look up and into the infamous death strip and learn about what it was like to live in East Berlin during the Cold War. It’s a great way to finish the day after learning so much on the tour. It’s only a few stops away from Ostbahnhof where you can get off and finish the day at the East Side Gallery. 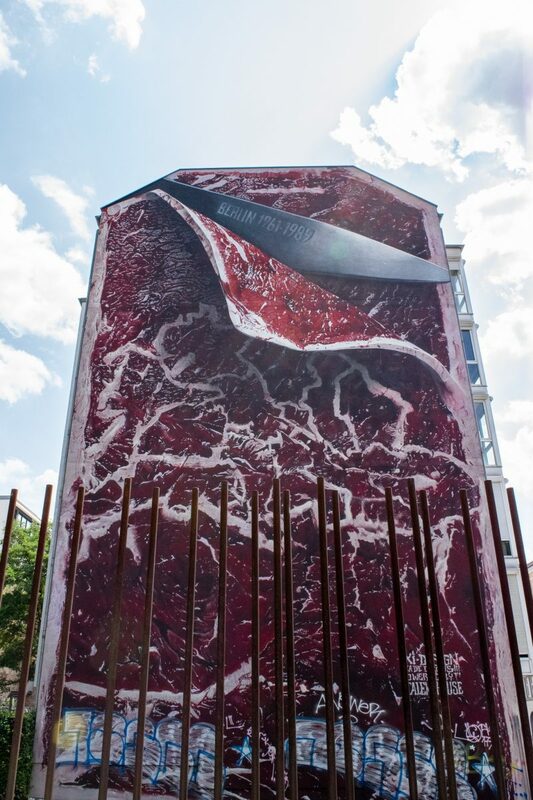 This is where you’ll find all of the political and beautiful paintings along pieces of the Berlin Wall. If you’re anything like me, you’ll want to finish the day off with a beer. 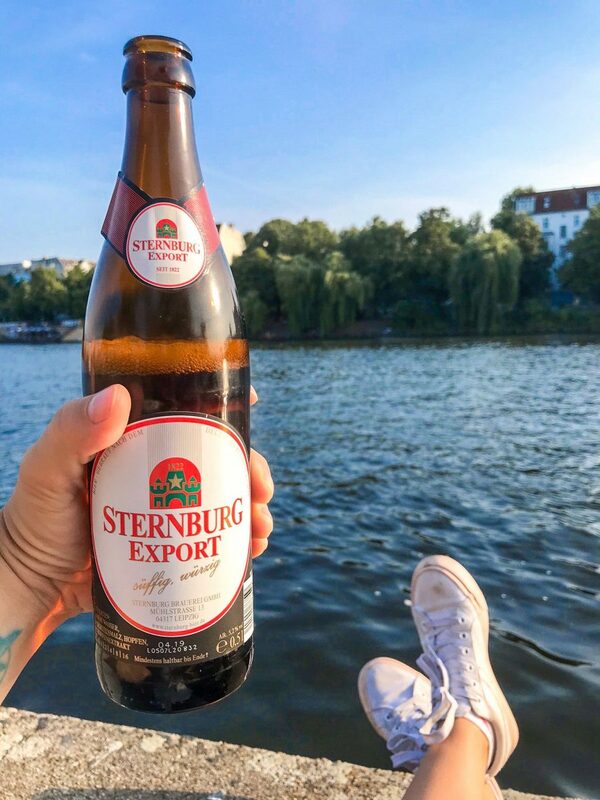 If it’s warm and sunny, grab a few beers and some food and take it to the park along the Spree at the end of the East Side Gallery. There are several shops near the Warschauer-Strasse train station where you can buy snacks and beers. The best part is that the shops usually have bottle openers so you can just pop open the ones you buy and head straight to the park. One thing that I think is a can’t-miss when you only have 3 days in Berlin is the concentration camp, Sachsenhausen, just outside of Berlin. 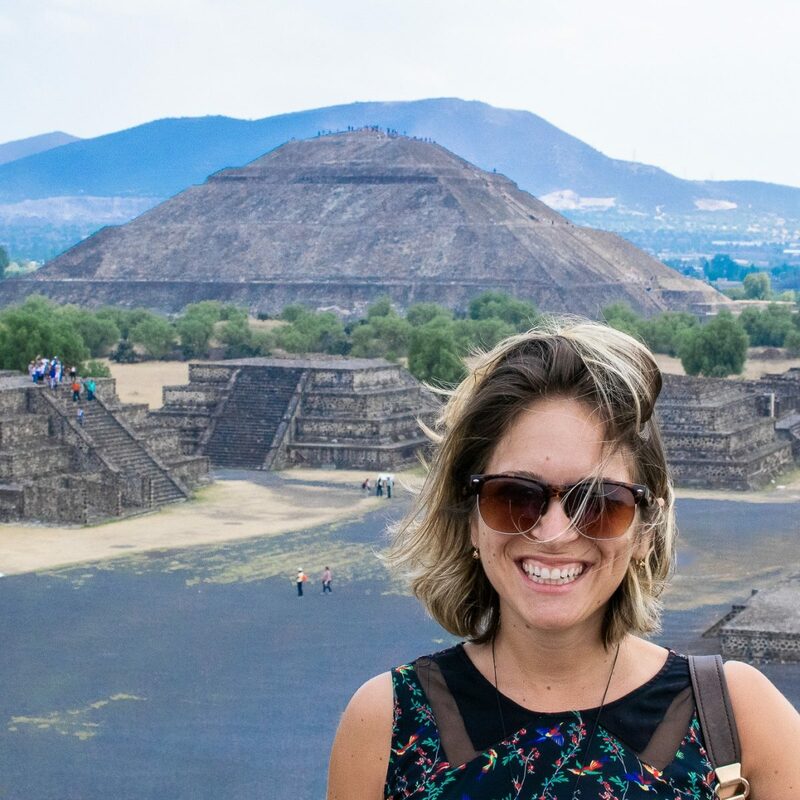 The best way to go is with a tour and, in my opinion, the best tour company to go with is Mosaic Tours. This is one of the only companies that run tours to Sachsenhausen that are not-for-profit. Any profits that they make go directly back to Sachsenhausen to upkeep the camp for visitors to continue to use. The tour costs €18, which is a little bit more than the tour run by the camp itself, but the groups are nice and small and the guides are so knowledgeable and passionate about helping you understand exactly what happened here. The tour that you can go on done by the camp itself has tons of people on it because they only run one or two a day. You have to make your own way to the camp and then you can sign onto the tour once you get to the visitor center. 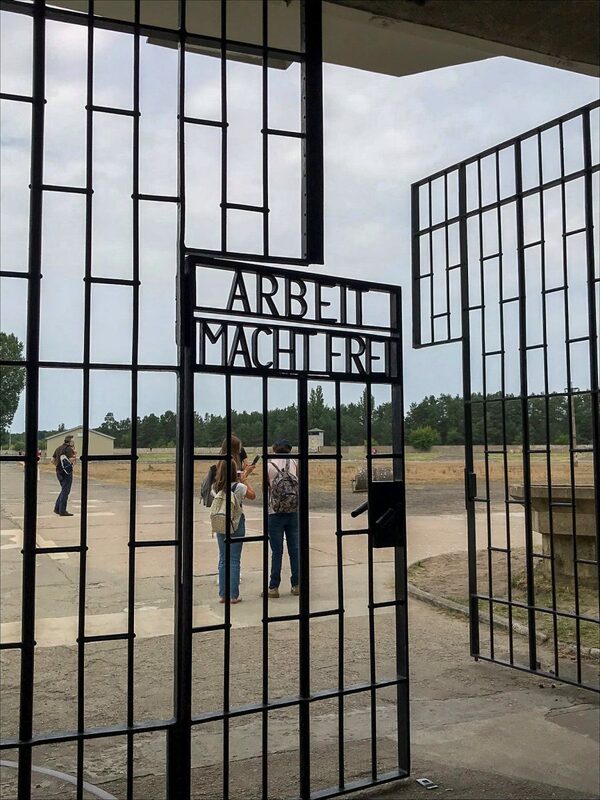 I don’t want to give too much away about what you’ll learn here, but having visited one other concentration camp in the past (Dachau in southern Germany), this is incredibly different and was, in fact, one of the most important places for the SS during World War II. It was something of a headquarters for all of the concentration camps with so many big decisions being made here. It’s an incredibly sobering place, as you might expect, but I really wanted to learn more about this side of World War II. The tour starts at about 10 am and meets at Alexanderplatz. You take the train to the camp, learn all about the town that the camp is in and by the time you get back to Berlin city center, it’s about 4 pm. While you can visit the camp without a tour and simply get an audio guide to use around the grounds, I really recommend going on a tour to get the full experience and to learn as much as you can. On your last night in Berlin, I highly recommend getting yourself to Prenzlauer Berg where you can have a drink at Berlin’s oldest beer garden, Prater Garten. Their pilsner is pretty fantastic and you can enjoy it in the sunshine. They also have pretzels, sausages, and a few other snacks to enjoy. However, I think you should save your appetite for one of the best kebabs in Berlin. Across the street from Prater Garten is K’Ups Gemüse Kebabs. Their durum kebab is one of my absolute favorites that I tried in Berlin (and I tried quite a few! haha).